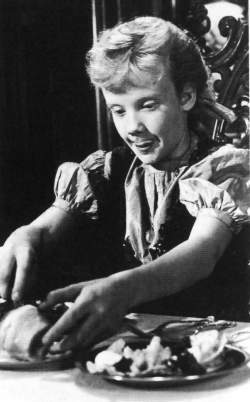 Born into a prominent English theatrical family, Hayley Mills made her screen debut as an infant in her father John Mills' 1947 film SO WELL REMEMBERED, and later took British audiences by storm as a twelve-year-old murder witness in the crime thriller TIGER BAY (1959). But it wasn't until she came to the United States and made a series of wholesome family films under contract to Walt Disney in the early 1960s that Hayley became a superstar. Her good looks and wide-eyed innocence, in addition to her talents for both comedy and drama, made her one of the most popular teen stars of the decade, though her career eventually stalled when she attempted to abandon her squeaky-clean Disney persona. At right, Hayley as the title character in POLLYANNA (1960), her American film debut and the role which won her critical applause, a spot on the cover of LIFE Magazine and a special Academy Award for the most outstanding juvenile performance of 1960 -- the last such award to be given by the Academy. 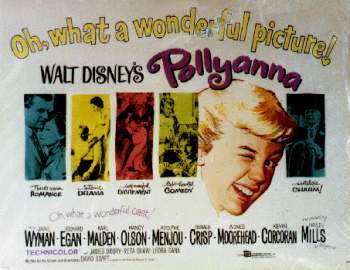 See Jane Wyman teach Pollyanna what it means to be a Harrington (a .MOV file courtesy The Walt Disney Company). Watch Pollyanna go shopping for "store bought clothes." (a .MOV file courtesy The Walt Disney Company). This star-studded Disney adaptation of Eleanor Porter's classic story of a little girl whose infectious optimism wins over her crusty old aunt and indeed, the entire town, also features outstanding supporting performances by Hollywood veterans Jane Wyman, Donald Crisp, Agnes Moorehead, Adolphe Menjou, Karl Malden, Richard Egan and Nancy Olson. "You must be awfully glad... that you're so very rich!" --as Pollyanna Whittier in POLLYANNA. "Father always used to say that if we ever had the money you have, we'd have steak and ice cream three times every day!" --as Pollyanna Whittier in POLLYANNA. "Store bought clothes! What do you think of that, Elizabeth?" --as Pollyanna Whittier in POLLYANNA. "Oh! Boston." --as Susan Evers in THE PARENT TRAP. "Wanna Fig Newton?" --as Susan Evers in THE PARENT TRAP. "Oh, Miss Inch. I cahn't tell you how very much I've enjoyed my stay here. I--uh--shahn't tell my ahunt about the ahnts--uh--ants, nor the debutants, shall I? Well--uh--good-bye." --as Susan Evers in THE PARENT TRAP. The following year in Disney's THE PARENT TRAP (1961), Hayley played Sharon Mckendrick and Susan Evers, twin sisters separated at infancy by the divorce of their parents who meet each other at camp and plot to reunite their family. 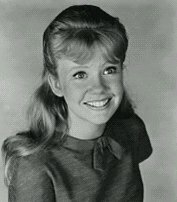 For more on the special process that made one Hayley Mills into two sisters, read the Classic Tech Talk article on Matting. Sharon and Susan discovering they are sisters (a .MOV file courtesy The Walt Disney Company). 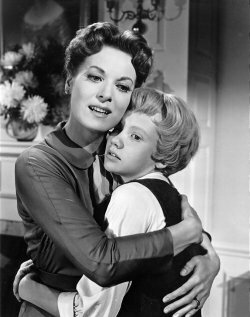 Together again and indistinguishable to their parents (Maureen O'Hara and Brian Keith), the twins deliver an ultimatum (a .MOV file courtesy The Walt Disney Company). Though much of THE PARENT TRAP's 1960s take on divorce is dated, and Disney attempted to remake it in 1998, this original version of the film is still charming and highly entertaining. Hayley's performance(s) and those of her veteran co-stars Maureen O'Hara (with Hayley at left), Brian Keith, Charles Ruggles, Cathleen Nesbitt and Una Merkel, still stand up more than forty years later -- as do most of the special effects. And the story was such a popular one that Disney reincarnated it three different times during the 1980s as made-for-TV movies starring a now-grownup Hayley, again as twins, but this time with her children playing matchmaker. 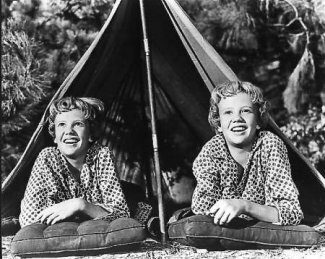 Projecting a slightly more mature and complex screen image than POLLYANNA, THE PARENT TRAP proved a box office smash and made Hayley a teen superstar on both sides of the Atlantic. She even cut a hit record for Disney which included the top-ten single "Let's Get Together" from the film. "Let's Get Together" (clip) (a .MP3 file courtesy the Walt Disney Company). Hear the film's title song, "The Parent Trap" (clip), sung by Tommy Sands and Annette Funicello over the opening credits of the film (a .MP3 file courtesy the Walt Disney Company).